Controlls: WADS or arrowkeys, spacebar. Escape to exit. Note: This has been a lesson in scope and time management for me. 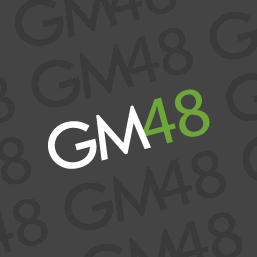 The next gm48 will be spent doing things I understand already and can implement quickly as a method. Also, I think you can toggle all ugly debug things with f1 if you like because I forgot to take it out. Oddly enough, the explosions kind of made the music... they feel too regular though. Would have been better to have them being timed with more randomness! Ha! The responses have been better than i expected. I'm interested to see how much i can improve in the next jam. Elivator to hell, going down. Thanks! Its something I've thought about for a mobile game. It's really short even by jam standards, but the content you put in it it's really cinematic and immersive, the cutscenes are a nice touch and you can't even notice when they end and the gameplay starts. But the gameplay itself is kinda dull, even though the game doesn't last enough for it to actually become boring. You actually polished it really well, despite the art and sounds being just average, I can see a lot of potential for a really cinematic game, you just need better assets. Man thanks a ton. I could see a better game to it, but with my management of things I wasn't able to iterate past the bare bones. You know what? So far nobody has criticized the lackluster control of the dropship. I had spent maybe 2/3 of a full day of the jam on a movement system that didn't pan out. What you experience in the game in that regard took about 40 minutes because I used what I knew worked. And even then I was able to learn something small and use on the spot. It's been a good experience for me. Nice game. It's fun dodging stuff and the intro/outro cutscenes are cool. Some of the graphics look a bit off, but I like the clouds(?) that fly upwards as you fall and the stuff that shoots at you. The sound effects are pretty good too. I'm glad you enjoyed it. I learned a lot of things to avoid doing for the next jam. I liked the smooth transition from the intro to the gameplay, it would have been nice if it did the same to the end screen. The AA guns should aim at your ship to some degree because as it is now there is no challenge. I think you can win just about every time without needing to move the ship at all. You're right. And that would have been just a line of code or two. I had originally planned for an enemy to shoot more directly at the player to catch their attention, and cause them to move unwittingly into the AA fire. Thanks for playing. Really nice one, I particularly like the "seamless" transition, even with simple graphics I think it works really well. That's too bad about the time management, a little more polish on explosions & gameplay (you can stay in the bottom realtively safe) would have added a lot ! Lol thank you. Twenty minutes before the deadline the mothership at the top of the screen was a giant purple square and I couldn't get my only background to work. I was pulling my hair out trying to figure how to manipulate view points for a long time in this project. I wasn't always working on that particular problem, but it was always on the mind. The trick turned out to be "view_visible[0...7]". That was my "in" to using the cameras, there would be no game without it. I figured to place camera objects (not gms2 cameras) in a bigger room and switch between them depending on the player location or state. It all takes places in one 720 height room. Going forward from this jam I might say take the room views and pre make a camera object for each one like objCamera1, objCamera2 etc. Then it would be easy to move them around and do tricks. Oh and you're right about being too safe at the bottom of the screen. I was running around with my hair on fire at the time ;). Neat little game. I was a little confused at the start whether I should be hitting buttons or waiting for something. Perhaps some explicit (on-screen text) or implicit (Perhaps some cinema-style bars) ways to separate the automatic portion of the intro from the gameplay start. I was also very confused when it started burning? when the sprite changed. The sounds got a little repetitive too while dodging explosions, perhaps some randomization on pitch to alleviate that. Thanks for the kind words. I blew my time budget in this project and absolutly everything became a rush job. But it was a good lesson for me. The burning you mention was supposed to represent orbit reentry, the ship heating up in the atmosphere. I made the effect large to cover up the dropship rotation from profile to top down. Because i sure didn't have the time or skill to animate that. Pilot your dropship to the platform. Avoid gunfire.